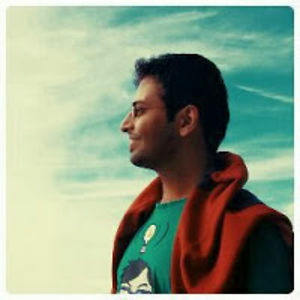 My name is Chaitanya Limaye and I am a freelance illustrator, animator and visual storyteller. I have been drawing since I was a kid. Over the years I have worked as an animator in animated and VFX films like Disney's The Jungle Book and have illustrated book covers and designed for merchandise. I absolutely love the incredible feeling of seeing a character come alive in real surroundings. 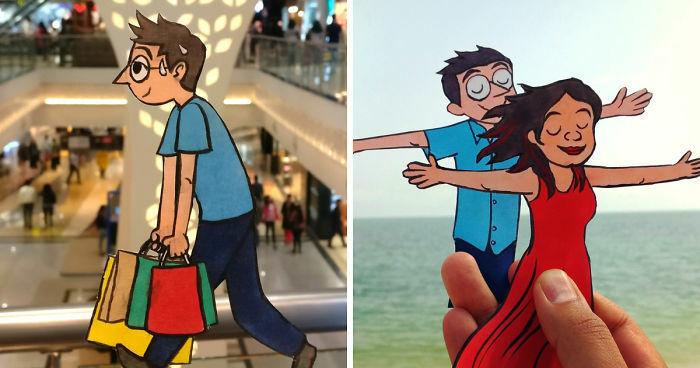 I make illustrations of a little cartoon version of myself (whom I call 'Chai') and photograph him in different locations. This is an ongoing project that I post on my Instagram page. 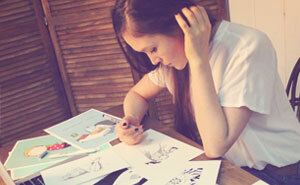 Usually, I draw, paint and animate digitally. Doing this project makes me get away from the computer and draw and make things with paper, markers, scissors and camera in the most tactile way to bring the character to life. I have always enjoyed taking photos of interesting things I notice every day - may it be the sunlight striking the leaf while making it glow, a puppy relaxing at the door of a cobbler's shack or busy market street. I thought a combination of my interests in illustration and photography would be even more fun and another way to do visual storytelling! I want my work to create a strong connection with my audience. Take a peek at Chai's world through my Instagram page. #1 That's Chai Ready And Packed Up With His Passport For Our Trip To Malaysia! Love this! Also, look up and see the beautiful sky! #5 Chai Stepped Out In The Afternoon And All That Left Of Him Was An Omelette. Damn Summer Heat! Mangoes are messy, but so delicious! I'm with you, Chai!! I love Chai too. Both, that is! He looks like Waldo but easier to find! #12 Ru & Chai Enjoying A Long Talkative Walk. It Was Their 2nd Anniversary! lol that looks straight out of a bollywood movie! #16 Chai Fulfilling His Cravings For Fresh South Indian Filter Coffee! Hahah, that is me too! Blue or more Blue? That is the question! #19 How Much Ever Hot Summer Gets, It Always Has A Silver Lining For Chai - Mangoes! #22 The Third And Final Stage Of Experiencing Mangoes To The Fullest. Here's Chai Savoring The Lingering Taste And Letting Out A Flavorful Burp. The Sense Of Delight That Mangoes Bring Is Like Nothing Else! #23 Time For The Festival Of Colors - Holi! #25 Lots Of Colors! Chai Loves Visiting The Art Store Every Now And Then. It's Like Visiting Paradise! I looked for this song on YT and found it, and it's lovely! Though I have no idea what he is saying, hahah. I love his art style. Boy, Chai sure loves mangoes! I wonder how many he could eat at once?